Our weekly Blues Jam is hosted by 3 Bay Area gems - every 1st Wednesday, we welcome our newest addition of St. Pete's "who's who", Someday Honey, featuring Kaleigh Baker, Mark Cunningham, Matt Walker and Sam Farmer! 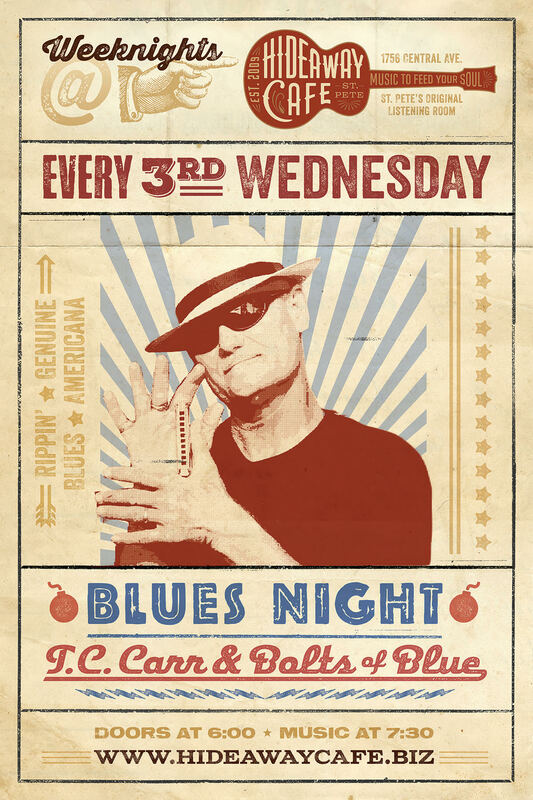 Every 2nd and 4th Wednesday, the Betty Fox Band, routinely named Best of the Bay's "Best Local Blues Band" brings the blues and invites other well revered local players up to join in on the jam and every 3rd Wednesday you can find the legendary TC Carr sharing the stage with his Bolts of Blue Band. If a 5th Wednesday is on the calendar, then you get something really special - a blend of TC Carr's Bolts of Blue Band & Betty Fox's Band. Whatever the case may be, Wednesdays are filled with some of the area's finest talent, so come on out and be a part of something great!